What's a green card, and why do you need one to work in the United States? A green card authorizes an individual to live and work in the United States permanently. A green card is valid for ten years and must be renewed subsequently. A green card holder can apply for U.S. citizenship after five years as a lawful permanent resident. A green card is formally known as a Permanent Residence Card or USCIS Form I-551. The reason it's called a green card is that the original card was made of green paper. The card has been other colors and redesigned many times since it was first issued, but it never stopped being known as a green card. Today, it is still green but not made of paper. Also, it has graphics and fraud-resistant security features that are highly secure and more tamper-resistant than the ones that were previously used. A green card holder (or permanent resident) does not hold the same status as a United States citizen. However, people with a green card can apply for citizenship after a number of years of residency, with exceptions made for those who marry U.S. citizens or come to the country as refugees. While green cards can be obtained through family, investment, refugee status, and other special conditions, green cards can also be obtained through employment. Here's more information about the different types of green cards and how to receive a green card through employment. First preference (EB-1): Individuals with special abilities, distinguished academics, professors, researchers, and international executives are eligible for first preference permanent residency. People can provide evidence for why they should receive first preference. That evidence can range from a Pulitzer or Nobel Peace Prize, an athletic award, membership in a professional association, to a publication. Second preference (EB-2): Professionals with an advanced degree or workers with exceptional talent. This also includes foreign nationals interested in a national interest waiver, which is a petition for a visa status that someone can apply for if he or she already has a firm job offer. Third preference (EB-3): Skilled workers and professionals are eligible for the third preference visa. Workers are required to have at least two years of experience and professionals usually require degrees from accredited universities. Fifth preference (EB-5): Individuals who are eligible for the fifth preference visa include immigrant investors who are willing to invest between $500,000–$1,000,000 in a venture that creates at least ten new jobs for U.S. citizens or other lawful permanent residents. Consult Visa Bulletins that are issued during the year by USCIS for the latest information. They include adjustments regarding eligibility and the application process that occur during the current cycle for applications. Green card through self-petition: Distinguished individuals with exceptional abilities, or specific individuals who are granted a national interest waiver, can file for a green card. Green card through investment: An individual who establishes a business venture that creates new jobs in the U.S. can apply for a green card. His or her green card would likely fall into the EB-5 category. Special category green card: This includes workers in established special immigrant categories, such as broadcasters, international employees, and certain religious workers, for example. The green card application process differs based on the method in which one seeks to obtain a green card. However, when a foreign national with a job offer seeks a green card, either the foreign national or the employer must fill out an I-140 (Immigrant Petition for Alien Worker). Generally, an employer will fill out an I-140 approval notice, which grants the employer the option to employ a foreign national on a permanent basis. In some instances, foreign nationals with exceptional abilities can self-petition for an I-140 filing. 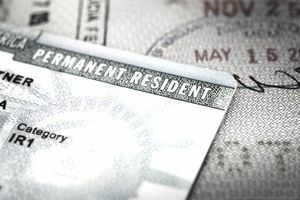 Once the petition is approved, the foreign national can apply for a green card through Form I-485, Application to Register Permanent Residence, or Adjust Status. With this application, the foreign national can request to remove any conditional requirements from his or her status. If the priority date for the foreign national is current, he or she should be able to file the I-485 and I-140 at the same time. The annual Green Card Lottery program (officially the Diversity Immigrant Visa program) is another opportunity for potential immigrants to become permanent legal residents of the U.S. This program runs each year and provides green cards to applicants who are randomly selected in a lottery process. The annual lottery began in 1995 and seeks to ensure diversity in U.S. immigration. To be eligible for the Green Card Lottery program, you must be a native of a country with a low rate of immigration to the United States. Applicants from countries that have sent more than 50,000 foreign nationals to the United States in the last five years are unable to apply for this visa. You must also meet the education or work experience requirements. In order to qualify for the lottery, a person must have at least a high school education or two years of trade work experience. There is no cost to enter the Green Card Lottery. The only way to apply is to complete and send a form electronically through the U.S. Department of State’s website during the registration period. Many companies also offer to help with the application process for a fee, but using these vendors does not increase a person’s chances of being selected. There are many scams related to green cards and U.S. visas. Fee for Green Card Lottery Scams In this scam, companies or individuals claim that, for a fee, they can make it easier to enter the U.S. Department of State's annual Diversity Immigrant Visa (DV) (Green Card lottery) program or increase your chances of being selected. No organizations are authorized to assist with the green card lottery process or will be able to increase your chances of being selected for a visa. Helping With Visa Applications There are websites that offer to process visa paperwork or request money to complete lottery forms. The only official way to apply for the Diversity Visa (green card) lottery is directly through the official U.S. Department of State website during the registration period. There is no fee to apply. Fees for Government Forms There is never a fee to pay for a U.S. government form. If a website is charging for government forms, it's a scam. Government forms and instructions for completing them are always free from the government agency that issues them. Fees for Services Websites, email messages, letters, or advertisements that say they can help you obtain a visa for a fee are fraudulent. These websites and emails cannot help you obtain a visa. For example, many fraudulent emails offer U.S. visas or "green cards” in return for a sum of money. Visa services can only be obtained from official U.S. government entities, including the Department of State, a U.S. embassy or consulate, or the Department of Homeland Security. Identity Theft In addition to soliciting payments for visa services, scammers may also seek your confidential information for identity theft purposes. Do not disclose any personal information on third-party websites or via email. You will not receive an email message notifying you about winning a visa from the U.S. Government. In addition, no other organization or private company is authorized to notify DV applicants. Check your visa status online. All email related to visa applications will only come from a ".gov" email address, which is the official U.S. government email account. All visa-related correspondence coming from an address that does not end with ".gov" should be considered suspicious. To avoid scams, apply directly on U.S. government websites, which end in ".gov." Also, review this fraud warning from the Department of State.